"We call on the European community to support our demand, and to insist that relevant institutions and governments take urgent action," said Yüksel Koç on behalf of the hunger strikers in Strasbourg. 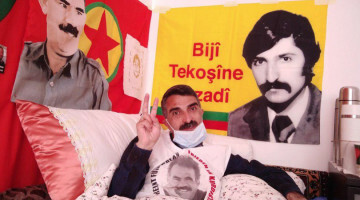 KCDK-E co-chair Yüksel Koç, who has been on hunger strike for 66 days together with 13 of his friends demanding the end of isolation against Abdullah Öcalan, has issued a call on the European public on behalf of hunger strikers. 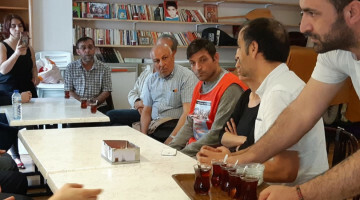 Stressing that the health problems suffered by the hunger strikers are getting worse, Koç wrote about the reason of their fast, the meaning of isolation and what activists expect from the European public. Why are we on hunger strike? “The prolonged solitary confinement of Abdullah Öcalan on the İmralı island prison has continued since his unlawful abduction on 15 February 1999. On 18 March 2014, the European Court of Human Rights (ECHR) found that the systematic isolation imposed upon Abdullah Öcalan had violated the prohibition on inhuman and degrading treatment contained in Article 3 of the European Convention on Human Rights. Even though this policy of isolation was identified as a kind of torture by the ECHR, it has been intensified by the Turkish state. Mr Öcalan has been deprived of contact with his lawyer since 27 July 2011, and, over the last four years, his family has been visited only two times. Both of these visitations were the result of hunger strikes. 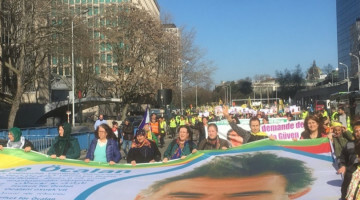 Presently, in order to break the absolute isolation imposed upon Mr Öcalan, there have been a number of democratic actions, demonstrations and activities undertaken by the KCDK-E and other European and Kurdish institutions, groups and initiatives. 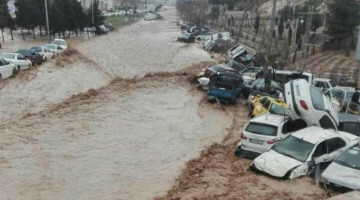 Additionally, many meetings have been conducted on this topic with local, national and international organisations. However, the silence of the European Committee for the Prevention of Torture (CPT) and European countries concerning this ongoing isolation have encouraged Turkey to persist with its policies. 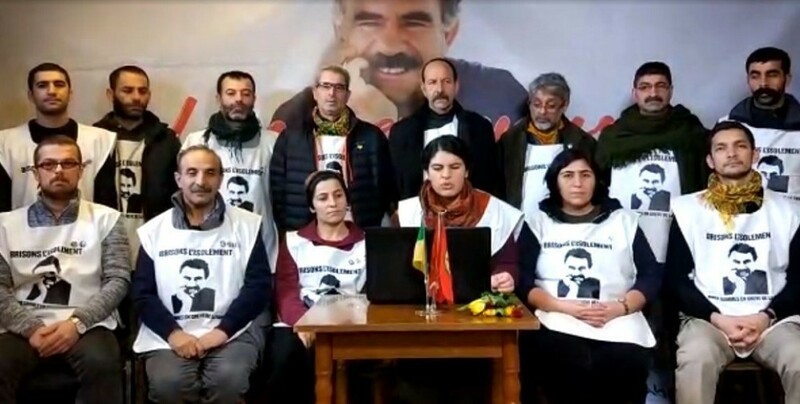 Within this framework, even though this form of action will lead to severe consequences, we decided to begin a hunger strike in order to end the solitary confinement imposed upon Mr Öcalan and push the government of Turkey to reinitiate peace talks with the Kurdish Movement. As a matter of human dignity and human rights, we call for an immediate end to the isolation imposed on Abdullah Öcalan. We call on the European community to support our demand, and to insist that relevant institutions and governments take urgent action. 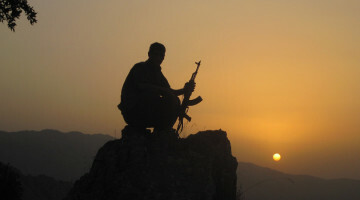 What does the isolation imposed on Mr Öcalan mean? The main reason for our hunger strikes is to lift the isolation imposed upon Mr Öcalan. Isolation is a form of torture – it is a violation of universal human rights and is a crime against humanity. With its intensified isolation policies against Mr Öcalan, Turkey’s AKP-MHP government has begun a new form of attack and implemented new policies of violation towards the people and against the democratic politics. 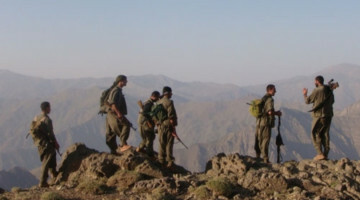 The Turkish state initiated an armed military attack on the Kurdish towns within the country, including Cizre, Nusaybin, and Şırnak, and aimed to empty these areas. During these brutal military campaigns, over 200 young Kurdish civilians were burned alive in basements of apartments. There are currently approximately 10,000 Kurdish politicians, including co-chairs of the progressive Peoples’ Democracy Party (HDP), members of parliament, mayors, and other party members detained and imprisoned. The AKP-MHP government has appointed their trustees to govern the municipalities that were previously governed by democratically-elected mayors from the HDP. 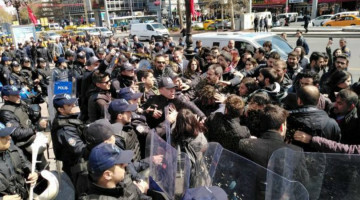 Thousands of academics have been taken to court, lost their jobs, arrested or imprisoned because they have demanded a peaceful solution to the Kurdish issue. Similarly, all defenders of human rights, activists, journalists and others who oppose the belligerent policies of the Turkish state have faced systematic pressure by the state. 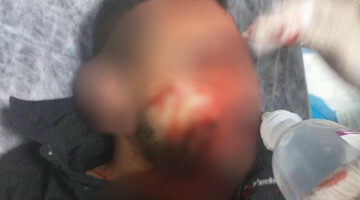 These violent policies have been applied beyond the borders of Turkey as well, targeting the peoples of Syria, mainly Kurdish, Assyrian and Arabs citizens of the country. 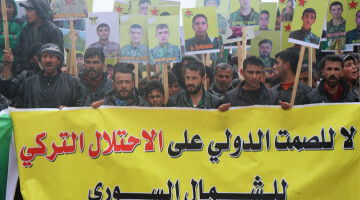 The Turkish state has pursued a policy of ethnic cleansing towards the Kurds of Syria – the entire city of Afrin in northern Syria is now occupied by Turkish forces and their allies, and is being openly Turkified by the Turkish state. 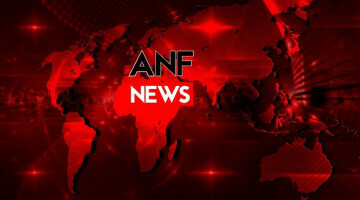 The Turkish state has also perpetrated acts of aggression against the Kurdish people within Iraq’s borders, and has bombed and killed civilians in Yazidi-inhabited area of Sinjar (Shengal), which is still recovering from the genocide recently committed by the ISIS terrorist group, and elsewhere in South Kurdistan (Iraq). The Turkish state implemented all of these policies have begun following the peace negotiations that took place between them and Mr Öcalan from 2013 to 2015. The negotiations were ended following Turkish President Recep Tayyip Erdoğan’s order to the state institutions in 2015 to cease participation in this process. This decree by Erdoğan was followed with the isolation once again imposed upon Mr Öcalan, and the Turkish state’s commitment to a policy of complete war towards the Kurds and all oppositions groups. During the time of peace negotiations from 2013 to 2015, there was a ceasefire and there were no killings on any side of the armed conflict. All the components of Turkey’s society were engaged in discussions on the solution process, with some writing freely in favor of a peaceful solution and working for an end to the conflict. 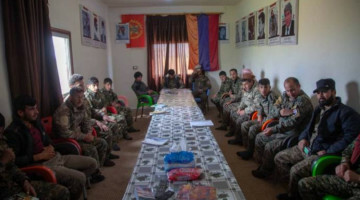 The Rojava revolution, the process ongoing in northern Syria, has given birth to a new system of self- governance which is first example in the Middle East of a project for free women in society which allows all different ethnic and religious groups to live free and coexist, with their democratic rights and diverse identities protected and promoted. 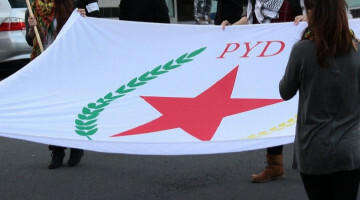 The HDP, which was established at Mr Öcalan’s suggestion, attempts to apply similar ideas to society throughout Turkey. The HDP, which received 13% of votes in Turkey’s general election in June 2015, represented Kurds, Turks, Assyrians, Laz, Circassians, Alevis, Yazidis, Christians, and Muslims, and, most significantly, brought equal representation of women to Turkey’s parliament. This democratic and peaceful environment that lasted for a few years in Turkey was eliminated step by step by Erdoğan’s belligerent intervention. This environment gave way to a situation in which the AKP-MHP government would only offer society more conflict, violations of rights, and militarism. This process allowed Erdoğan to establish single-man rule for himself. The process that started with the isolation of Mr Öcalan has reached a stage where entire Turkish state was transformed into a dictatorial system granting Erdoğan unchecked power. We, as the Freedom for Öcalan Initiative, formed by democratic institutions’ administrators, politicians, former HDP MPs, journalists, lawyers, academics, women rights defenders and activists, would like to express our support of HDP MP Leyla Guven’s indefinite hunger strike and her demands. Her demands are also our demands. These demands are the common demands for all of the hunger strikers that are currently on the strike in South Kurdistan, Britain, the Netherland, Canada, Germany (Duisburg, Nurnberg, Kassel), Austria, and Strasbourg, and in Turkish prisons where 313 political prisoners are also taking part in this action. The very short meeting between Mr Öcalan and his brother on 12 January 2019 and the release of our friend MP Leyla Guven are a result of our resistance, but are far from being an adequate reply to our demands. We would like all the public opinion to know that we love the life very much. We chose this act to open a way for life, not to die. To open a path for life against war and mass killings, we have given our bodies to hunger, just as Gandhi did. We are doing this not only for the democratic advancement of the Kurdish people, but also for sake of free and equal coexistence for all peoples, ethnicities and religious groups of Turkey and the Middle East. We love all humanity, and in order to protect the right to life in a free and democratic environment, we risk our lives as a democratic act and method of seeking a solution. We know that the European public opinion and peoples’ political and civil groups support our humanitarian demands, but, at this juncture, this support must be increased. On the 66th day of the hunger strike, my health and that of seven of my friends has reached a critical level. Despite this, we will continue our hunger strike until our demands are met. To prevent any death, everyone should do their best so that our demands are accepted. We call upon European public opinion to be in solidarity with us and support our democratic and legitimate demands in order to persuade the decision-making bodies of European Commission and the European governments to take the necessary steps towards a solution.